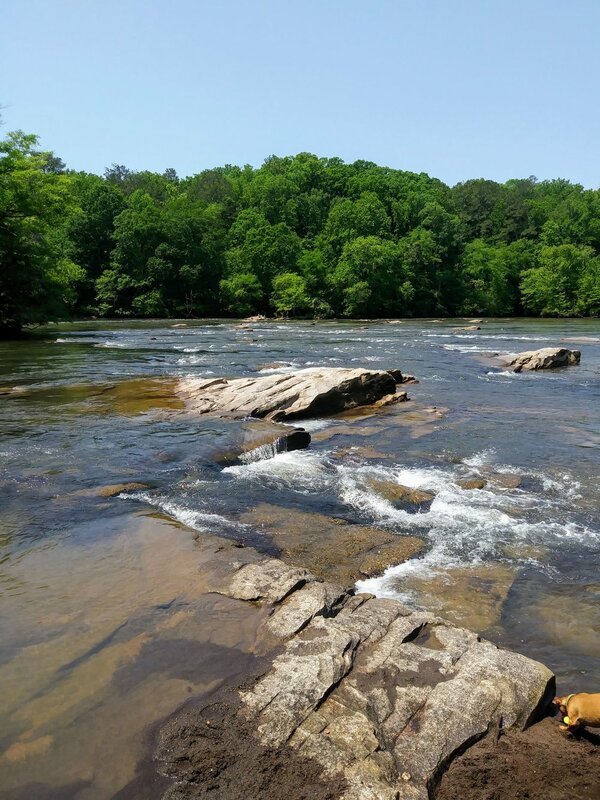 I'll never pass up a chance to visit the Chattahoochee whether it's the headwaters trickling out of the side of a mountain, the serene trails of Bowmans Island, or the churning rapids in Columbus. BUT my favorite part of the Chattahoochee is, hands down, a small stretch in Roswell along Riverside Road. This section is just a little hole in the wall swimming area full of large boulders to perch on and some islands in the middle of the river. It doesn't have a parking area nearby so it's mostly filled with people who live nearby or who are willing to walk quite a ways from the nearest park. It doesn't have an address and those who know it, just know it. I call it the "Roswell Riviera". We used to come here a lot during the summers because James actually grew up in a neighborhood nearby and his parents would drop us off. Sadly they moved away a few years ago and we haven't visited as much since then. It's such a special place though and we have a lot of memories here. Some are really lame like when I got a horrific rope burn trying to swing off a rope swing into the river. But others are sentimental. We actually got married in the neighborhood clubhouse with views of the Chattahoochee in the background. 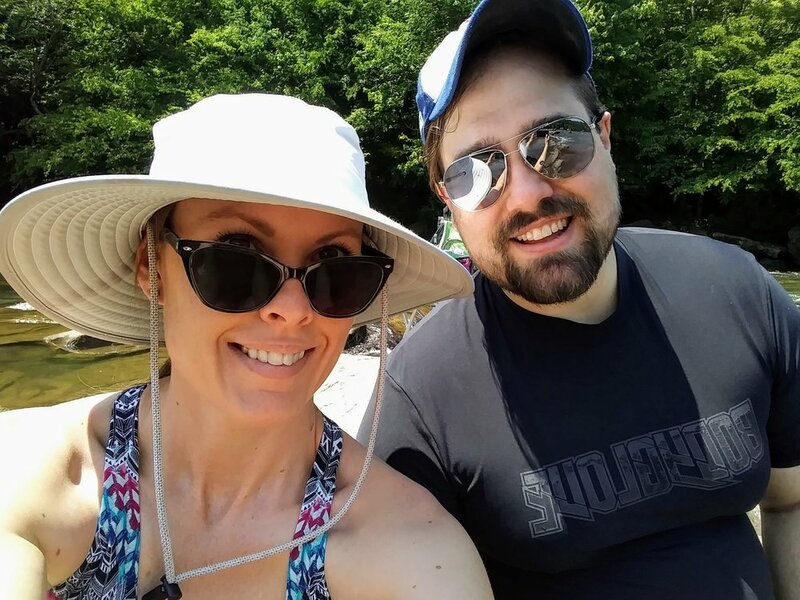 A few weeks ago on the first blazing hot weekend of the year, we decided to park at the Roswell Underpass Park and trek all the way down to our favorite swimming hole. Our dogs love it here and seeing them happy makes me happy too, despite the death match that ensues when we have to bathe them afterward. 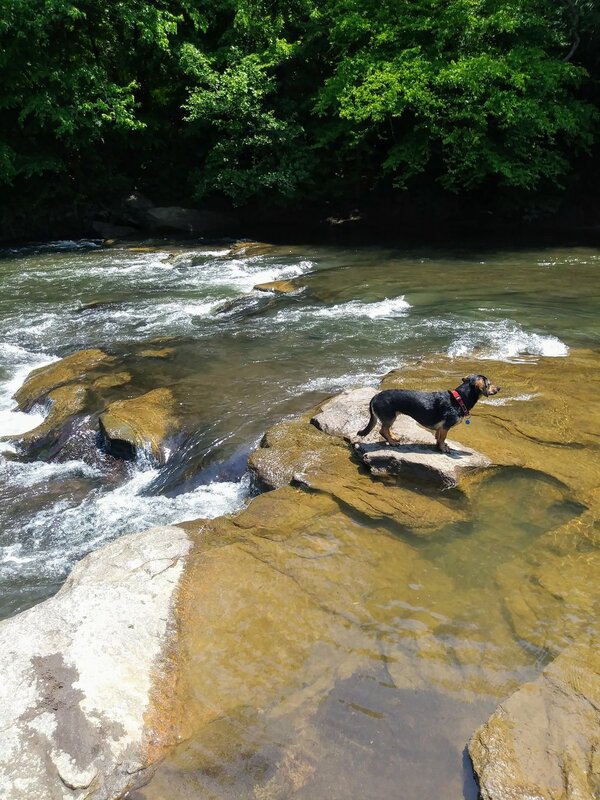 Our bigger dog, Tennille, loves to swim and actually learned how to swim right here. Our little dog, Nova, is not such a huge fan but we have a life vest for her. They both love to dig around in the sand and chase after geese. We don't really do anything monumental when we come here. No real hiking, although there are a network of trails along Riverside Road. Sometimes I try to swim but Tennille always leaps into the water after me in a panic if I go to far away. We just sit on the rocks or put up a hammock along the banks of the island. We throw a stick for the dogs to fetch or skip rocks. A lot of other people come here and do the same things. It's very refreshing to just see people sit and enjoy the scenery. For some reason I feel like I go back in time when I'm here. Not just going back 8 or so years to when James and I first came here together, but like I'm going back generations. Just hanging out at a swimming hole feels like a very old timey thing to do and I love it.